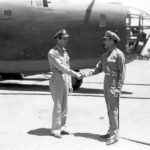 On June 17, 1942 Kenneth N. Walker was promoted to Brigadier General then assigned to the South-West Pacific Area (SWPA) and flown with Brigadier General Ennis Whitehead arriving in Australia on July 11, 1942. Immediately, Lieutenant General George Brett sent Walker and Whitehead on an inspection trip. In New Guinea, Walker flew three combat missions and survived an air raid against Port Moresby. 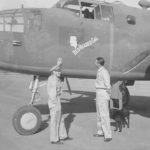 On July 22, 1942 Walker flew as an observer aboard a B-25 Mitchell from the 3rd Bombardment Group, 13th Bombardment Squadron against Japanese landing off Gona on the north coast of New Guinea. 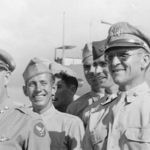 That same day, he also flew as an observer on a B-26 Marauder from the 22nd Bombardment Group that searched for the Japanese convoy headed back to Rabaul. 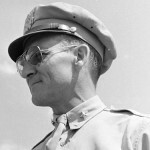 For his role in these actions during July, Walker earned the Silver Star in August 1942. In Australia, Walker was based in Garbutt Field at Townsville, Queensland Australia. He took command of Allied Air Forces in northeast with the aid of Royal Australian Air Force (RAAF) Group Captain William H. Garing. Under Walker’s command were units in Townsville, Cairns and Horn Island. 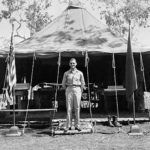 Walker was given the authority to reorganize the northeast command area which General Kenney had described as a “scrambled outfit of Australians and Americans [that] resembled a can of worms.” In Townsville, Jan Arthur was assigned as his personal driver. 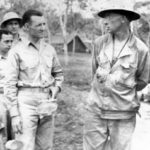 Photographs of General Walker in Australia. Gen. Douglas MacArthur standing with a group of Allied American and Australian leaders in front of his B-17E “Bataan” 41-2593 parked at Garbutt Field at Townsville, Queensland, Australia circa 1942. Left to right: Hon. F. M. Forde, Minister of the Army, Gen. MacArthur, General Sir Thomas Blamey, Maj. Gen. George Kenney, 5th Air Force Commander, Maj. Gen. C. A. Clowes, Brig. Gen. Kenneth Walker, Commander, 5th Bomber Command. In early August 1942, Walker accompanied a civilian from Washington DC on a classified mission to gather information about potential uranium deposits in Australia. On August 4, 1942 the pair flew from Townsville to Darwin to meet with Australian officials. Two days later they traveled to Alice Springs then back to Townsville. 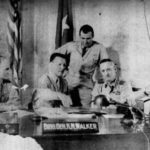 On September 3, 1942 Walker was appointed as Commanding General (C. G.), V Bomber Command (5th BC), 5th Air Force and was headquartered at Garbutt Field in, Townsville in Queensland, Australia. 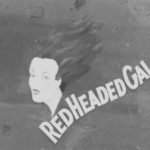 In Australia, he was assigned B-25C “Red Headed Gal” 41-12797 as his personal aircraft. An active pilot, Walker personally flew between Townsville and Port Moresby in this aircraft during 1942. General Walker with his personal aircraft in Australia. On September 3, 1942 5th Bomber Command was formed. On September 4, 1942 General Douglas MacArthur wrote to express his approval of Walker’s performance thus far. I want to tell you how delighted I am at your splendid work. The improvements in the efficiency of the Air Corps has been marked since you assumed command. I fully expected it but am very proud at its realization. 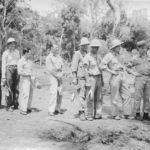 During the middle of September 1942, Walker was sent to Port Moresby to oversea the 5th Air Force advanced echelon (5th ADVON). Conditions were primitive and air crews were overworked. 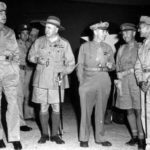 Photographs of General Walker in Port Moresby. Walker met many distinguished visitors including World War I ace pilot Eddie Rickenbacker on a Pacific inspection trip. Also General Hap Arnold, Chief of the Air Force who toured the theater in the end of September 1942. 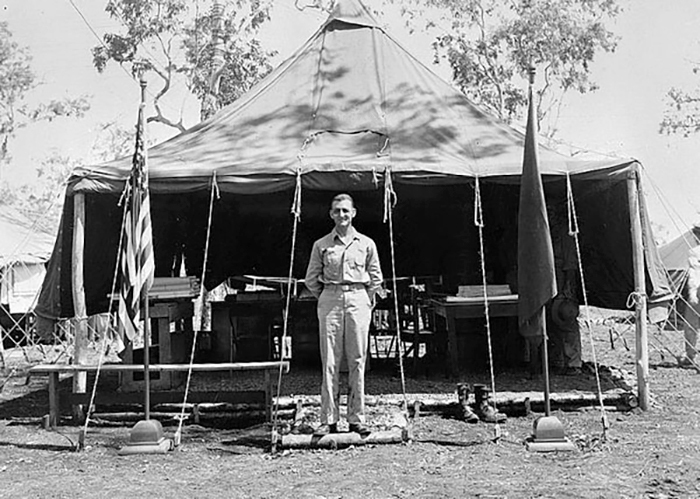 On October 15, 1942 Walker attended an award ceremony for aircrews from the 19th Bombardment Group at Mareeba Airfield in Queensland, Australia. Also in attendance was Major General George C. Kenney (C.O., 5th Air Force) and Lt Colonel Richard H. Carmichael (C.O. 19th Bombardment Group). LIFE photographer George Strock took extensive photographs of the ceremony and were later used in a news wire story “Nemesis of Big Jap Force”. Award ceremony photos by George Strock. 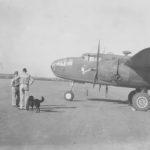 On January 1, 1943 Walker flew as an observer aboard a B-24D Liberator 41-24077 from the 90th Bombardment Group, 320th Bombardment Squadron that took off 5 Mile Drome (Ward) near Port Moresby on a bombing mission over Rabaul. Arriving over the target at 6:45am they found the target area covered by clouds aside from Simpson Harbor which was clear with approximately 100 vessels inside. The B-24 made a bomb run from approximately 8,000′ against a large transport but the bombs did not release, nor did they on a second bomb run. Targeted by anti-aircraft fire and intercepted by Zeros, B-24 turned back towards base and escaped into clouds. 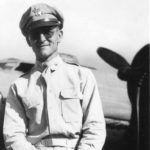 Aboard, the gunners claimed two Zero shot down that were verified by General Walker. This B-24 returned with the bombs aboard, landing back at 5 Mile Drome (Ward) by 10:00am. On January 5, 1943 Walker flew his final mission an observer aboard B-17F “San Antonio Rose” 41-24458 over Rabaul. He and his crew went Missing In Action (MIA).